9" x 6" x 9.25"
Recalling the giant in the story, Jack and the Bean Stalk, or the legend of Odysseus and the Cyclops perhaps helps to understand the impact of this helmet mask. In order to enter manhood in the Makondé culture, boys participating in the initiation ceremony were forced to overpower and unmask the Lipiko, a non-human creature of substantial force. 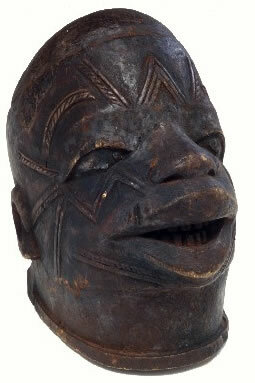 The upturned head, dull-witted look, heavy-lidded eyes and the crazed, gaping mouth are features of Lipiko. In secret, men in the village carved the mask of a balsa-type wood and went to great lengths to keep the true identity of the wearer of the Lipiko mask concealed. Muti wa Lipiko literally means "head of the Lipiko."